The stars of the Sundance hit Blindspotting, Daveed Diggs and Rafael Casal, rolled into town a few months ago just as shooting began here on the sequel to Ryan Coogler's Creed. All three grew up in Oakland, where Diggs and Coogler were Bay Area track standouts. Both have gone on to have major success in the arts: Diggs won a Tony for playing Jefferson and Lafayette in the Broadway smash Hamilton, Coogler directed the Rocky sequel (he's executive producer of the upcoming Creed II) and of course Black Panther. Everybody in the movies talks of one day working together, but Diggs and Casal are serious about using their local Oakland connections to persuade Coogler to collaborate on an idea of theirs. "We have this dream project that we kind of need him for," Diggs said. "Can't start putting that out yet, sorry," said Diggs. OK, but there's a rumor that somebody is doing a remake of White Men Can't Jump — Diggs and Casal are interracial buddies (good friends since childhood), Coogler can shoot sports movies, could that be it? "There's a problem," Casal said. "We can't play basketball. We would embarrass ourselves. The movie would have to be, White Men Can't Shoot Pool or White Men Can't Bowl." "Or white men can't sit in a bar and drink," Diggs aid. "That's really more in our lane." So they won't talk about their dream project (both men sing, rap, and act, so it could be anything), but Casal did say that he watched White Men a bunch of times while working on the final draft of Blindspotting, admiring Ron Shelton's writing, and admiring the sure-handed way the movie mixed serious racial issues with comedy. Blindspotting works that same territory, Diggs said: "It's a buddy comedy in a world that won't let it be one." Meaning that lead characters Collin (Diggs) and Miles (Casal) are best friends who "are always trying to get a laugh, to make each other laugh, and they've been able to to that most of their lives, but we're meeting them at the moment when that becomes too hard for them to keep it light." Collin is trying to stay clean as he clears probation. The mischievous Miles — he carries a gun, precipitates fights, uses drugs — exposes Collin to crazy risks, a carelessness that could be looked at as a form of privilege. The situation escalates when Miles witnesses an officer-involved shooting — his sense of justice for the victim and instinct for self-preservation come into conflict. 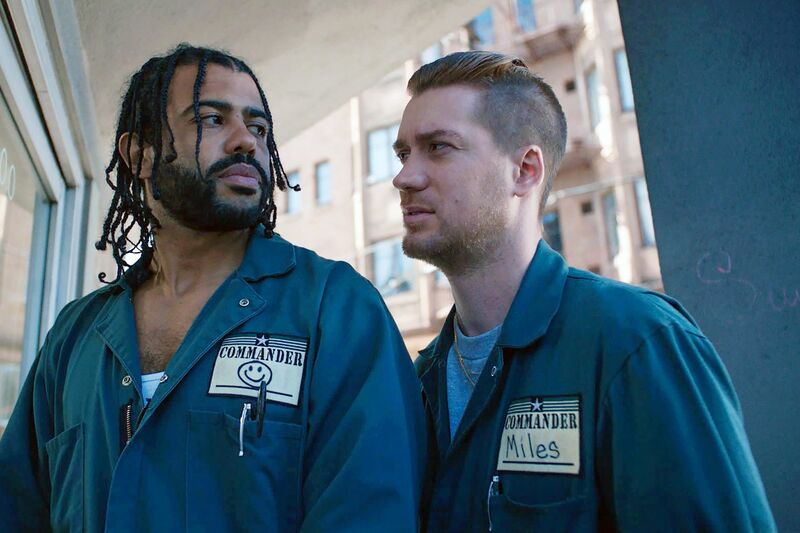 These elements have earned Blindspotting the reputation of being a heavy drama, but it is often seriously funny, relying on the lifelong comic chemistry between the two leads, whose movie also tells the story of a changing Oakland. "We always talked about it as a comedy. Coming out of Sundance, our point of view became: We want to surprise people with something, let's have people be surprised at how funny the movie is," Diggs said. "Yeah, we figured the better bait-and-switch would be to have people going into a movie thinking it's going to be really serious," Casal said, "and then find out that it's also funny." Other recent inspirations, they said, include the cancer-survivor comedy 50/50 (they initially wanted Jonathan Levine to direct), and The Big Sick. "Mixing serious content with comedy, it's not really that unique of a pairing. It's just that we have this huge hot-button issue in ours," Casal said. That issue is a white officer shooting a black man — the same kind of episode that inspired Coogler's fact-based debut Fruitvale Station. The happening in Blindspotting is fictional, but built around the very real tension the two felt every time a police cruiser rolled by. "In the movie, we try to [present] the police scenes the way we felt growing up, which is that you're in the ocean and a shark just swam by. Every time you'd see police, you'd be thinking, please don't see me, don't come toward me." Casal said. And yet the screenplay takes pains to humanize the officer, which was easy for Diggs to do. He spent his life in Police Athletic League competitions, and owes much of his success to friends on the force. "These are people who went door to door, raising money so that I could go to school." Which is why both men are hopeful that ongoing efforts to reform the Oakland police department will be successful, though both have since moved to Los Angeles, where their entertainment careers have taken them. When they return to Oakland, they are always newly surprised by the pace of gentrification — part of the drama (and the comedy) of Blindspotting, and something that Casal and Diggs wrestle with. "We'll go back and people will be, like, you have to try this restaurant, and I'm all conflicted. Like, I'm not going to not go just to be stubborn. So I go, and it's great food, and then I look around, and you see who's there, and you think: I just wish the people who went to the place that was here before this place could also be enjoying this. I wish they could get the benefit of it," Casal said. Right now, the busy Diggs (who is working on the TV adaptation of Snowpiercer) is enjoying seeing his pal Casal get the benefit of his Blindspotting buzz. "We're in L.A., and I love seeing all the meetings he's going to. And I also love that he's learning why I hate them so much."